Like the Common Snowberry, the Western Snowberry is a small shrub with pink flowers useful for feeding livestock and preventing erosion. 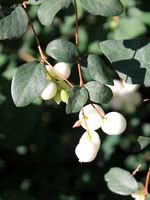 Unlike the common species, however, the Western Snowberry is much more suited to wet conditions, capable of persevering through poor soil drainage and occasional flooding. After the Snowberry's flowers have bloomed, it produces berries which often last on the plant through winter. These berries are toxic to humans, but livestock and local wildlife love them! Those hoping to attract wildlife to their property can plant Snowberry and expect to see animals foraging on it much later in the year than other plants.